Brooklyn, NY New York Methodist Hospital (NYM) was founded in 1881 by Rev. James Monroe Buckley who persuaded the Methodist Church to build its first hospital in the borough. The hospital is now one of the borough's largest medical facilities. 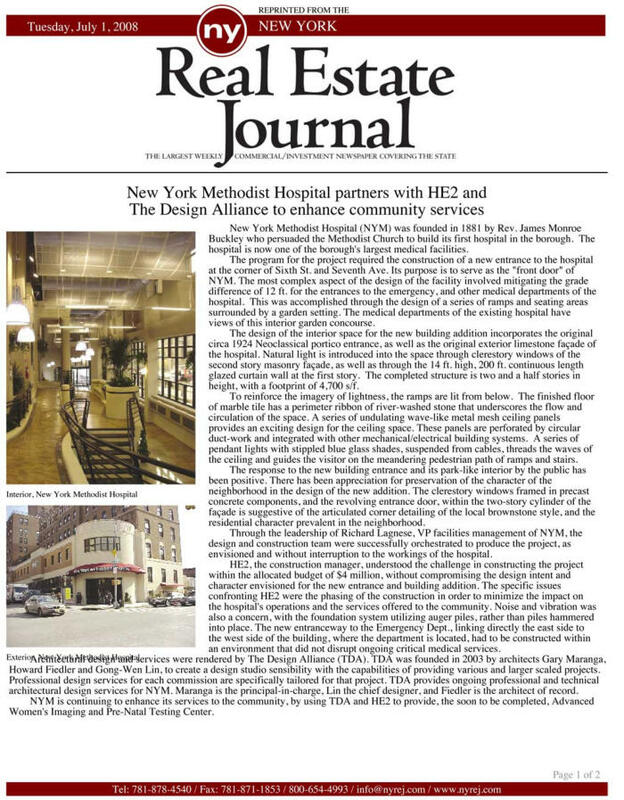 The program for the project required the construction of a new entrance to the hospital at the corner of Sixth St. and Seventh Ave. Its purpose is to serve as the "front door" of NYM. 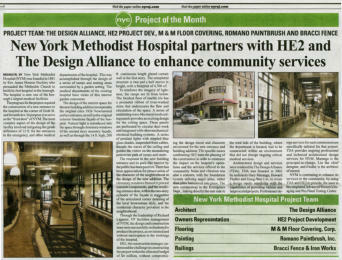 The most complex aspect of the design of the facility involved mitigating the grade difference of 12 ft. for the entrances to the emergency, and other medical departments of the hospital. This was accomplished through the design of a series of ramps and seating areas surrounded by a garden setting. The medical departments of the existing hospital have views of this interior garden concourse. The design of the interior space for the new building addition incorporates the original circa 1924 Neoclassical portico entrance, as well as the original exterior limestone façade of the hospital. Natural light is introduced into the space through clerestory windows of the second story masonry façade, as well as through the 14 ft. high, 200 ft. continuous length glazed curtain wall at the first story. The completed structure is two and a half stories in height, with a footprint of 4,700 s/f. To reinforce the imagery of lightness, the ramps are lit from below. The finished floor of marble tile has a perimeter ribbon of river-washed stone that underscores the flow and circulation of the space. A series of undulating wave-like metal mesh ceiling panels provides an exciting design for the ceiling space. These panels are perforated by circular duct-work and integrated with other mechanical/electrical building systems. A series of pendant lights with stippled blue glass shades, suspended from cables, threads the waves of the ceiling and guides the visitor on the meandering pedestrian path of ramps and stairs. The response to the new building entrance and its park-like interior by the public has been positive. There has been appreciation for preservation of the character of the neighborhood in the design of the new addition. The clerestory windows framed in precast concrete components, and the revolving entrance door, within the two-story cylinder of the façade is suggestive of the articulated corner detailing of the local brownstone style, and the residential character prevalent in the neighborhood. 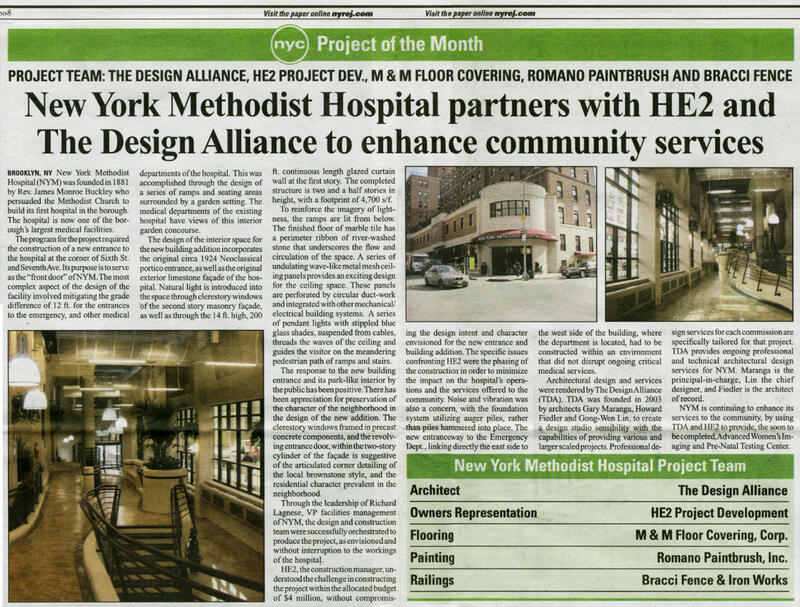 Through the leadership of Richard Lagnese, VP facilities management of NYM, the design and construction team were successfully orchestrated to produce the project, as envisioned and without interruption to the workings of the hospital. HE2, the construction manager, understood the challenge in constructing the project within the allocated budget of $4 million, without compromising the design intent and character envisioned for the new entrance and building addition. The specific issues confronting HE2 were the phasing of the construction in order to minimize the impact on the hospital's operations and the services offered to the community. Noise and vibration was also a concern, with the foundation system utilizing auger piles, rather than piles hammered into place. The new entranceway to the Emergency Dept., linking directly the east side to the west side of the building, where the department is located, had to be constructed within an environment that did not disrupt ongoing critical medical services. Architectural design and services were rendered by The Design Alliance (TDA). TDA was founded in 2003 by architects Gary Maranga, Howard Fiedler and Gong-Wen Lin, to create a design studio sensibility with the capabilities of providing various and larger scaled projects. Professional design services for each commission are specifically tailored for that project. 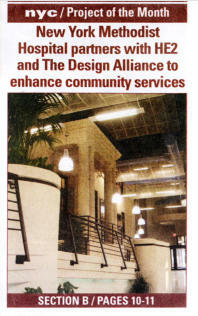 TDA provides ongoing professional and technical architectural design services for NYM. Maranga is the principal-in-charge, Lin the chief designer, and Fiedler is the architect of record. 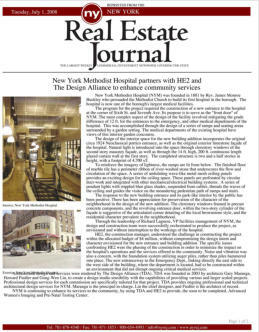 NYM is continuing to enhance its services to the community, by using TDA and HE2 to provide, the soon to be completed, Advanced Women's Imaging and Pre-Natal Testing Center.